Since 2008, Custom Fire Art has been dedicated to bringing our customers’ outdoor living dreams to life. We are pleased to offer custom design and installation of outdoor kitchens and barbecues for our clients in the greater Seattle metro area. An outdoor kitchen or custom barbecue not only adds value to your home but also creates a stylish and functional extension of your home’s interior living space. A well-designed outdoor kitchen can easily become your favorite room in the house! At Custom Fire Art, we believe your home and outdoor living space should be as individual and unique as you are. Whether you dream of an extravagant outdoor kitchen with all the bells and whistles of a professional chef’s kitchen, or a custom-designed area for an outdoor barbecue perfect for your personal get-togethers, Custom Fire Art has the experience and expertise to take care of you. 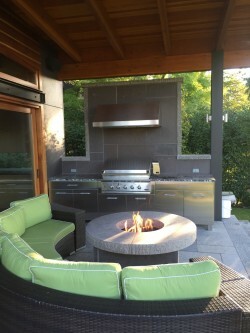 An outdoor kitchen designed by the team at Custom Fire Art can take your outdoor entertaining space to the next level. With our outdoor kitchen and custom barbecue design and installation services, the possibilities are endless. If you dream it, we can design it, and your imagination is the only limitation. Not sure where to start? That’s alright. We’ll work with you to design your outdoor kitchen or barbecue from the ground up, and walk you through every step of the process. We’ve built our business on a reputation for expert design, quality workmanship, and professionalism, so you can trust that you’ll be in good hands. Along with offering our customers expert outdoor kitchen and barbecue design and installation services, we also offer some of the most competitive rates in the Seattle, WA area and beyond. With our experience and your imagination, you can rest assured that your outdoor kitchen and barbecue area will be as unique as you are. We look forward to working with you to turn your patio or backyard into a luxurious outdoor kitchen or custom outdoor barbecue space that you will be sure to enjoy for years to come.